As spectators of desert warfare, Arab Bedouins have always had the front-row seats. For thousands of years they have watched vast armies wage war on the harshest of battlefields. 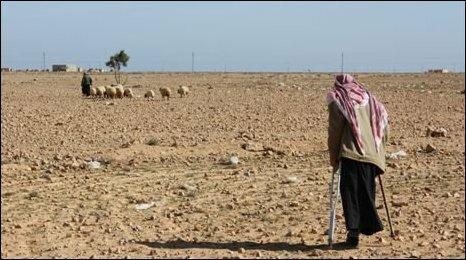 In 331 BC, the Bedouin were ringside, tending their camels, sheep and goats, as Alexander the Great mustered his men in the sands of Mesopotamia - modern-day Iraq - and conquered half of Persia. In 1942, their descendants were still grazing animals, this time in the Sahara, as they witnessed the massed armies of Montgomery and Rommel fight out the pivotal World War II battle of El Alamein. Today however, Egyptian Bedouin are not merely onlookers but reluctant combatants in a battle against death and injury in their ancestral lands. The Allied and Axis forces are long gone from North Africa but their lethal legacy remains - millions of rusting landmines, bombs, mortars and artillery shells lying in wait for the unwary shepherds and their children. The Desert Rats knew it as the Devil's Garden, this 40-mile belt of featureless land in Egypt's Western Desert. Heading inland from the Mediterranean today, you can see what the warring generals knew back then - that there were few natural barriers to shield men and munitions from the enemy, which meant fortifying their positions with millions of mines. Today there are no reliable maps of the minefields because their deadly crop constantly shifts in the desert winds. You cannot see the mines buried in the sand. When the Bedouin discover them, the hard way - ploughing them up in their olive groves or digging them up as they scrape a pit for a campfire - all they can do is mark the spot with a cairn of stones to warn those who follow. Already this year there have been four serious injuries and one fatality. And with legal action and demands for compensation in the offing, no country is prepared to accept responsibility for owning or laying the unexploded ordnance. Who then is to blame for the maiming of 11-year-old Mawa? She was a keen footballer until the day she kicked what she thought was a tin can. The rusted detonator blew her foot off and now she lifts her floor-length skirts to reveal a carefully-bandaged stump. It is infected at the moment - probably from her attempts to make the two-hour walk to the school she loves but can no longer reach. ''I can't run any more,'' she says. ''I can't play with the other children and I can't go to school at the moment because of the infection." She sits on her doorstep and cries, says her father Abdulaziz. While Mawa is sad, he is furious. ''I thank God she is still alive but I'm angry," he says, "because our life is destroyed." "I used to have sheep but I had to sell them because the children refuse to go to the fields now because they're too dangerous. "Psychologically and economically we have been badly affected. And we've had no compensation." The detonator could have been of Italian or German origin but Abdulaziz blames the British. "It was their battle," he said. "They brought the war to Egypt." Thousands of Bedouin are believed to have been killed or injured in explosions over the years but given their tradition of oral history, there is no written record. There is no legal precedent for landmine victims suing a foreign nation for damages. The group has already approached the UK government, which pointed out that it contributes about $15m (£10m) a year to the problem of uncleared mines globally. It says its financial help is directed at countries that have signed the Ottawa Convention - which puts in place a framework to support victims. So far, Egypt has refused to sign up. For the past 10 years, it is the Egyptian army that has had sole responsibility for clearing the detritus of war from the area around Alamein. The region is rich in natural resources. There is a huge amount of natural gas that lies buried underground and the Egyptian government suggests there could be 4.8bn barrels of oil, potentially doubling the country's existing reserves. Tourists are another target. This stretch of coastline is among the most beautiful in the Mediterranean - if only the land around it was not cut off by the minefields that property developers would dearly love to replace with golf courses and villas. The bravery of the thousands of Commonwealth, Italian and German soldiers, who fell far from home will forever be remembered in the tranquil cemeteries and mausoleums built along the coast. It was said of Alamein that before the battle the Allies knew only defeat. After it they tasted only victory. But for the Bedouin, Alamein marked only the beginning of the bloodshed. And almost 70 years on, World War II continues. For them it is equally cruel and it is never ending.